... I very much enjoyed the class. I love to cook and consider it a hobby; althought I'm used to cooking, I still learned tons of things. 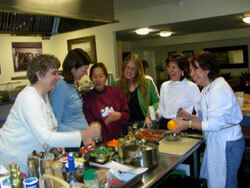 I liked that each class was divided into sections, the lecture part and the actuall hands-on cooking section. I must say that the "teacher" was wonderful and fully explained all concepts. Tips were great too. I couldn't have asked for more in a cooking class. ... I really enjoyed the class and learned a lot of good tips. I thought that we were going to learn more about cooking meat and creating basic sauces; but don't get me wrong, I truly enjoyed the class very much and learned a lot and realized that time is limited and it is impossible to go into details on everything. I'd like to have a class on cooking fish and also go on the field trip gor gagets and/or food as well as would like to take a class on quick meals for busy Mom's. Considering my lack of a basic foundation for cooking, these classes met and exceeded my expectations. The materials were informative and descriptive; this helped me to learn about the basics of many things. 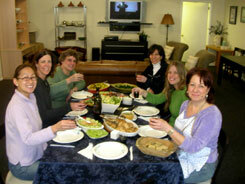 Additionally, I learned a lot while cooking and eating our food; it was fun too. I'd like to go on a filed trip to the store and am interested in a class on wine pairing. ...This was a wonderful class. I learned so many things, that I thought I knew; and now I learned it the right way! This classes inspired me to cook more at home! I look forward to attending more classes and being friends. The workshop was very good. The right balance of lectures, factoids, tidbits of informationand hands on practices. The chef/instructor was thorough and very knowledgeable in lot of different cooking techniques and did not limit herself to just providing the basic/elementary information. The utensil/gadget module was very informative and great for beginners that currently do not know or have the right kitchenware. A great aspect of the workshop is how flexible it was. Not only in picking recipes, but the instructor was able to include all elements into the hands on practices; including questions posed by the participants.